For the second time in less than a decade, El Segundo has been named the “Most Business Friendly City” among the 88 cities of Los Angeles County. The award, presented by the Los Angeles County Economic Development Corporation, recognized the city’s “tradition of excellence….taking a hands-on and active approach when partnering with its businesses.” The city was cited for its one-day turnaround in business licencing, low tax rates, expedited permitting process, strategic planning, and ability to attract and retain a dynamic range of businesses — as evidenced in the billion dollars in economic development currently underway in El Segundo. “Home to many Fortune 500 companies, including Mattel, DirecTV, and many prominent aerospace firms, the creative, cutting edge technology and manufacturing of El Segundo are fostered by its business-friendly practices,” the LAEDC recognition said. 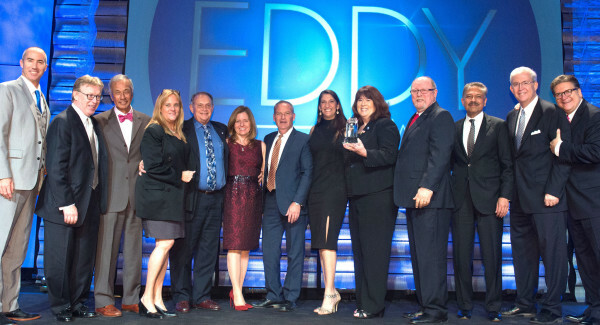 Mayor Suzanne Fuentes accepted the award on behalf of the city at the 20th Annual Eddy Awards ceremony last month. Fuentes described the honor as a “group award” but also singled out the leadership of City Manager Greg Carpenter, another El Segundo native whose steady hand at the helm has helped the city emerged from the recent recession stronger and poised for the surge in development now occurring. Carpenter’s accessibility has become legendary. Carpenter’s accessibility is indicative of the service-oriented culture that has become a hallmark of El Segundo. The city manager stressed that everyone at city hall, from economic development director Barbara Voss to public safety and public works employees, is a part of the city’s efforts to promote economic vitality. Almost every new business that arrives in town is initially shocked at city hall’s responsiveness. Many coming from LA or other larger cities are used to months-long permitting processes. By contrast, El Segundo is usually able to do business licensing in a day, and offers a pre-submittal plan check process — as well as staffing after hours and on weekends, as needed, in order to help get a business up-and-running as quickly as possible. “The staff takes the time to go through plans [in the pre-submittal process], so when businesses actually submit to plan check, they are already ahead,” Voss said. Voss, who worked for LACDC for five years prior to joining El Segundo last August, said she knew the city’s reputation coming in but was still struck when seeing its service mentality in action. Carpenter said the city’s small size has something to do with its ability to be proactive. “I think one of the benefits of being a small city, and having somewhat of a shared vision, is we are able to make decisions, including major decisions, fairly quickly,” he said. The city manager also said the city’s history is very much a part of its current DNA. El Segundo was founded as home Standard Oil’s second West Coast refinery, and since WWII has been considered one of the aerospace industry’s capital cities. That history is also reflected in the city’s tax rates. Ranging for Utility Users Tax to property taxes, El Segundo has among the lowest taxes in LA County. Perhaps most significantly, businesses are taxed on total square footage and number of employees rather than the Gross Receipts Tax more commonly used by other cities. “It can make a big difference in the annual cost of operating your business in a city,” Voss said. But the city has faced challenges, both with the decline of the aerospace industry and the recession, which required a reduction in city staff from 323 to 240 employees. The city responded to these challenges in two significant ways. During the very depths of the recession, the city also did something counterintuitive — at the urging of then-mayor Bill Fisher, the Economic Development Advisory Council (EDAC) was revived, bringing together private industry leaders, city management, and city council members for monthly meetings. “I don’t think there is any other city in LA County that has such an active economic development council,” Voss said. EDAC chair Drew Boyles is the founder of several local and regional businesses, including 1-800-GOT-JUNK and Hazaway Today, as well as the regional director of Entrepreneurs Organization. He admits, however, that he was initially skeptical of the development council. Significant aspects of the city’s current economic boom grew out of ideas originally aired at EDAC, including an emphasis on better marketing the city that resulted a public relations campaign led by PSM Communications that has helped draw a lot of attention to El Segundo. At any given meeting of the 18-member council, Boyles said, a wide range of topics that helps the city set its course are discussed in a freewheeling manner that has helped build creative momentum and attract businesses. The last meeting, for example, featured a speaker from the Economic Development Authority of Western Nevada, which helped recruit Tesla’s $5 billion dollar battery “Gigafactory” to the area. Another outgrowth of EDAC is the arrival of the prestigious business incubator Starburst Accelerator, which had great success in Paris and chose El Segundo as its second location. This happened, in typical El Segundo fashion, because the founders called and two days later were presenting at an EDAC meeting. Continental Development president Richard Lundquist offered the firm office space on the spot, and now, less than a year later, Starburst has arrived — last week, the firm held a “pitch contest” in which several cutting edge fledgling tech companies sought support and funding for new ideas to an audience that included venture capitalists, other startups, and aerospace titans such as Northrop and Boeing. The best, Boyles said, is likely yet to come.